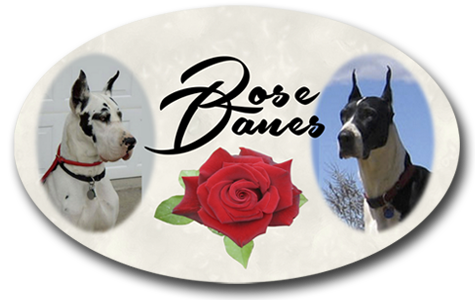 ALL OF MAISIE’S PUPPIES HAVE GONE TO NEW HOMES.Rose Great Danes welcomed Maisie’s and Hamilton’s litter on May 14th of 2011. Harlequin Boy Pup “Whoops” with his Mama Maisie as he turns five weeks old. Boy harl pup is almost five weeks old in this picture. The pups eyes are blue as they open. Mama Maisie plays with her harlequin puppy outside in beautiful Southern Colorado. Here is SOPHIE “Lil Bit”… with her cousin OREO, the one year old Mantle pup! Pups are enjoying their new pillow in their outside pen. SOPHIE the Mantle Great Dane pup with her ball… at five weeks. Roscoe with his new family!